Nothing but terrific thoughts for Tom Seaver, as he retires from public life to battle dementia. As a lifelong Mets fan, Tom is one of my all-time baseball heroes and a large part of my youth. Good luck to you Tom. I remember in League I would emulate Seaver when his right knee would scrape the ground. I wanted to be like that. I think it actually helped my control and stretching toward the plate. May God Bless him. Drop and drive! No one could generate more power from his lower half than The Franchise. Thanks for this poignant reminder! Tom, as a fledgling broadcaster, I had a memorable moment with Tom Seaver. I’d like to share it with you. It was Monday, April 14,1969, during the penultimate year of Connie Mack Stadium’s existence. The Mets would lose to the Phils 5-1. Jim McAndrew pitched raggedly, while Woody Fryman spun a nifty complete game four-hitter. It was the fourth game in a four game losing streak for the Amazins. By late afternoon they would be 2-5 on the season. Same old you know what. But about an hour before the first pitch, News Director, Phil Hubbard and I had flashed our “press passes” signifying we were from WOBM-FM in Toms River, NJ. The usher waved us right onto the field, past the field boxes about halfway between home plate and third base. We were hot stuff, man, too naive to realize nothing in life should be that easy! Tape recorders all set to go we spotted Seaver doing wind sprints about 50 feet away down the left field line. Baseball’s first steel-and-concrete stadium loomed in the background, now a hideous anachronism, with a handful of fans rattling around in the sprawling, rickety lower grandstand. We got a little closer and I shouted, “Hey, Tom, could you spare a minute for a quick interview?” He immediately stopped in mid sprint and came right over. I was too stunned to be nervous. He was super nice, and treated me like I was Vin Scully. I blurted out a few banalities and then asked the Mets’ best pitcher, “Do you think the Mets, with a few breaks, might just have the nucleus to be contenders this year?” I Didn’t believe a word of it. 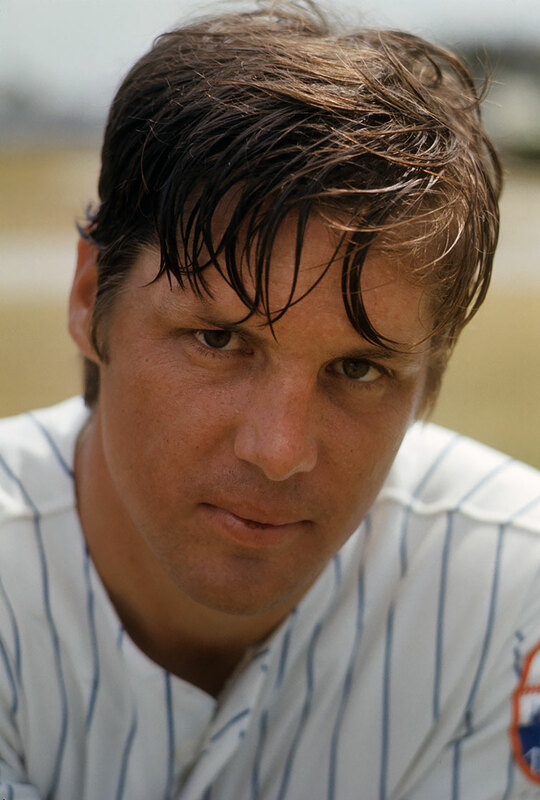 Seaver responded, “Bill, as you say, with a few breaks I really think we have the talent to contend this year.” He pointed out pitching would be the key. I thanked him profusely and the future Franchise went back to his wind sprints. Little did we know. Maybe with kids like Nimmo, Conforto, McNeil, Rosario, Alonso, Syndergaard, Wheeler and a Cy Young winner, good things will happen this year too, half a century later. And maybe that statue of “Tom Terrific” will soon be standing outside CitiField. Also a shout-out to Jim and his correspondence about an early Seaver gem he witnessed from the Shea field boxes in 1967! Who knew what lie ahead for Tom and the Amazins in those lovable loser days. My first game wasn’t until 1971 (also at Shea), so I always enjoy first-hand accounts of Mets games or encounters from the 1960s. Thanks for your memories!